A neat price drop for a solid case. Some people want a flashy, colorful case with jagged edges and crazy designs, while others just want a solid piece of metal to house their PC hardware. 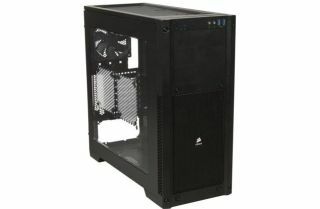 The Corsair Carbide 300R is a good, standard case, at a reasonable price. In fact, it's at an even better price today, as Amazon is selling the windowed version for £55.47. The Carbide line is Corsair's budget range, however that doesn't mean the 300R is totally lacking in what makes Corsair's more expensive cases great. The top of the case has room for two 120mm or 140mm fans, as does the side of the case. The top is also designed to accommodate a 240mm radiator for liquid cooling. At the back you'll have a 120mm exhaust fan, and at the front a 140mm intake fan. Plus there's room for another couple of 120mm or 140mm fans at the front. Overall the dimensions measure in at 19.1 x 8.3 x 17.7 inches, which big enough to fit everything you need inside, but not monstrous. It's in the drive bays and expansion slots where Corsair has cut the price. Three 5.25-inch external drive bays and four 2.5 / 3.5-inch internal drive bays is less than you'd find on more expensive cases, and there are also only seven expansion slots as opposed to the eight you'd find on other Corsair cases. The price cut is a good one, as the Carbide 300R usually flits between £80 and £90 on Amazon, and it's only in the last month or so that the price has truly started falling. There are certainly cheaper cases than this one available, but paying a little more for the extra features could be worth it now the price is down to £55.47. If you're looking for something a little different to this one, we've got 23 cases of all different shapes, sizes, and prices to recommend you.